1999’s Prehistoric Isle 2 sees dinosaurs on the rampage because it’s a video game and that’s just the sort of thing that happens. 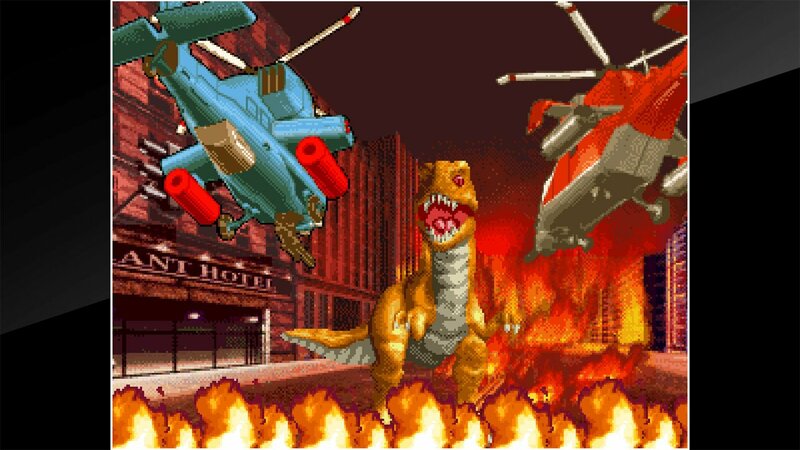 It’s up to you (or you and a friend) to jump into an attack helicopter and fly through six stages, blasting the dinosaurs back to extinction whilst also trying to rescue people along the way. There are two choices of chopper with different speeds and attack spreads, and a number of other items are also available to help you on your quest. 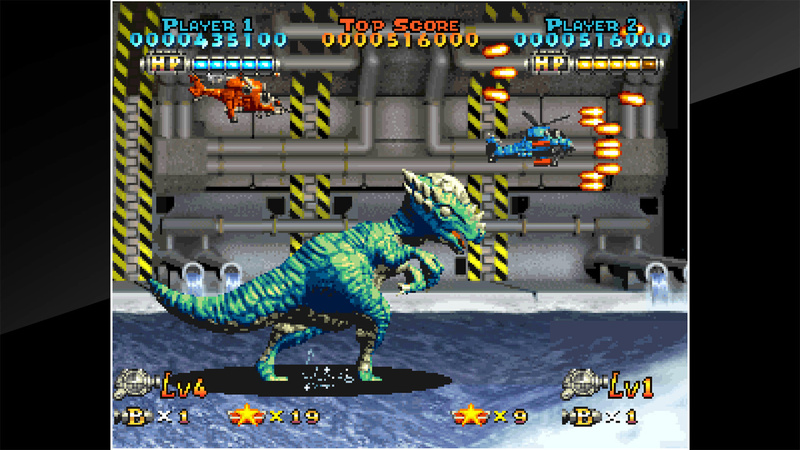 Arriving ten years after the first game (the pre-Neo Geo Prehistoric Isle in 1930), Prehistoric Isle 2 utilises pre-rendered sprites and backgrounds to provide a more visually impressive adventure although, like the SNES Donkey Kong Country games, it can look a little rough around the edges on modern displays. The first stage also makes clever use of animation on the background and your helicopter to provide pseudo-3D as you transition into the action. There’s a good range of locations flown through during your adventure, beginning in a city, but you’ll also end up flying through (amongst other places) a forest, a swamp, some underground caves and a factory. The third stage is unusual in that it takes place in a single location, above a forest, sunlight peeking through the clouds. The final stage also uses one setting, but as that consists solely of a boss battle, it’s more understandable. Other stages take in a variety of sights. For example, the second stage begins over the ocean, then has you flying through rocky ruins, up into the sky, down to a desert and then across to some clifftops where the sun is now setting. Some areas have more detail than others, but there’s plenty of scenic variety on your playthrough. Accompanying the action are a variety of weapon noises and beastly roars as well as music that is part adventurous, part sinister. It works reasonably well, although it can get repetitive at times. It doesn’t particularly annoy, but nor is it particularly memorable. There’s a mix of flying and ground-based creatures encountered, all of varying sizes with the ability to breath fire or spit glowing bullets at you. Pterodactyl, stegosaurus and diplodocus-like designs feature whereas others are less recognisable, but for the most part these fit in well, including some large insect-like creatures. Others are more fantastical such as a giant sandworm, reanimated skeletal remains and one boss that appears to have stepped off the set of a rubber-suit monster movie. The boss fights can feel a bit too straightforward. 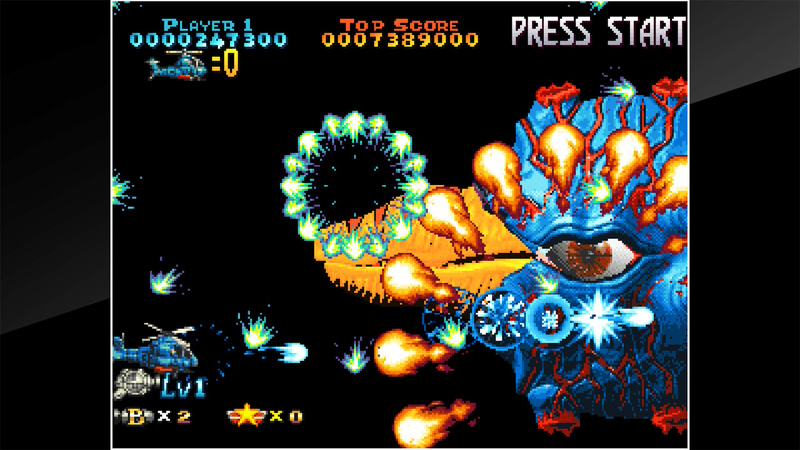 Though typically large (the final showdown plays similar to R-Type’s stage 3), there’s plenty of time to avoid the attacks, so once you get used to the patterns, surviving one of these encounters can be easier than a screen full of the regular enemy types. The game moves at a fairly steady pace with individual enemies being dispatched easily and their attacks not difficult to avoid. The challenge comes from their numbers which can soon see you swamped if you don’t take them out quickly, and the density of bullets increase to make survival much tougher. Another effect of this increased onscreen activity is noticeable slowdown. With the challenge increasing as you progress (as tends to happen in games) these occasions become more common the further you get and it can be quite offputting. 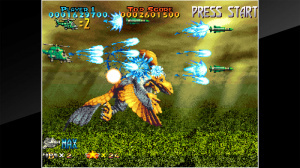 To help combat the various beasts you encounter, powerups are available to upgrade your cannon and add various types of missile as a sub-weapon. The first game featured a pod that could be collected and repositioned to provide you with various options, but this has been dropped for the second game; you now have a limited number of bomb attacks to get you out of tight spots or deal extra damage to bosses. 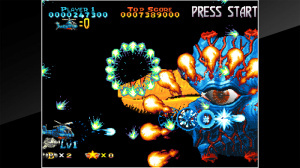 Additional bombs can be collected and a ‘Super Bomb’ powerup occasionally appears that, when flown in to, will damage all onscreen enemies. 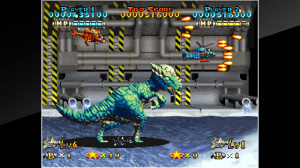 Your game time is not just spent blasting prehistoric creatures, however, as there’s also some rescuing to be done, although, to achieve this, you will still be blasting a bunch of prehistoric creatures. There are occasions where the game comes to a stop and you must protect groups of people as they clamber aboard a rescue helicopter. Some get left behind and other people can be found scattered across the stages. In these instances, you fly to them and they will grab a rope, dangling below until either an enemy attack blows them off or you find another rescue ship. Dive into the options menu and you can adjust the difficulty, and you can also alter how you tackle the game. You can either go for a single life with an energy bar or multiple lives that are lost after a single hit. Whichever you go for, the presence of unlimited continues means simply clearing the game is not difficult, but if you’re looking to improve your score, you’ll be wanting to put off using a score-resetting continue for as long as possible. Lengthy survival is a good way to improve that score, but additional points are awarded for your rescuing escapades. Point-awarding bonuses can also be collected and, should you fully power up your cannon, a brief bonus time activates a multiplier to rack up those points. As always, HAMSTER has included an online leaderboard for you to try and move up in the arcade mode, and also with the one-credit Hi Score and five-minute Caravan modes, both of which restrict you to the game’s default settings. 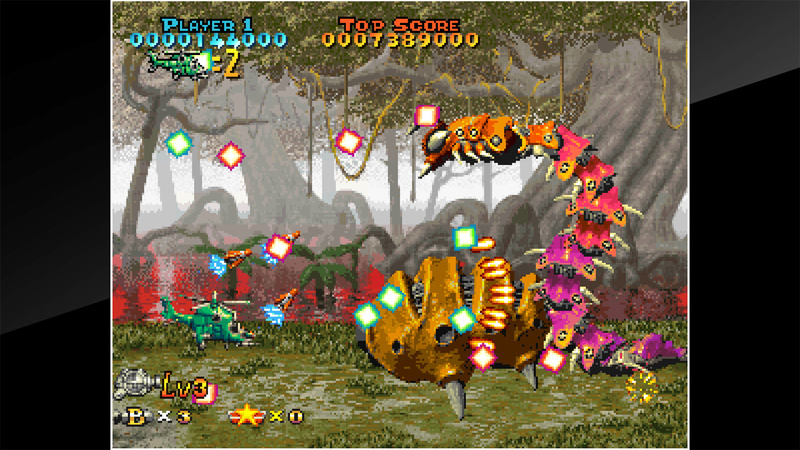 With a different visual style to most of the retro shmups on Switch, and dinosaurs and similar enemies to blast, Prehistoric Isle 2 stands out visually from the other options on the eShop, although the presentation is harmed by instances of slowdown and unremarkable (if inoffensive) audio. Enemy attacks are all quite similar, but the gameplay is still reasonably entertaining thanks to their constant arrival onscreen, requiring plenty of movement and firing to prevent becoming overwhelmed. The rescuing portions provide a bit of variety, but boss battles are not particularly memorable. Overall, Prehistoric Isle 2 can provide some fun, but we wouldn’t class this as a ‘must-play’ title amongst the many shmups currently on Switch.